Below are the available locations for all of Sarah Lindsay Photography's Senior photo shoots. Each section has a description, directions, and sample photos of real photoshoots from the location. McKay Lake doesn't have a physical address - please follow the directions below. McKay Lake is a cute spot with beautiful scenery, some mountain views, a lake, paths, bridges, trees, and more! Dogs are allowed on-leash here. The parking lot at McKay Lake is a little small, so I suggest arriving early just in case you need to park in the neighborhood across the street or down the road. See example photos below! From the East, take I-25 to 144th Avenue. Go West on 144th Avenue to Tejon St. Turn South into the parking lot. ​From the West, take 144th Avenue to Tejon St. Turn South into the parking lot. I will meet you in the parking lot! Don't hesitate to text or call if you get lost. Standley Lake is a great location in Westminster with mountain views, trees, a lake, paths, greenery and more. Please be aware, the parking lot gates lock at sunset (or 8pm) and they will lock the gate with your car in the parking lot. To avoid this, we can park across the street in the neighborhood if we think our photoshoot will go too late. See the example photos below! From the East: Take 86th Parkway West to Simms. Turn North into the dirt parking lot. From the West: Take 86th Parkway East to Simms. Turn North into the dirt parking lot. ​I will meet you in the parking lot! ​Don't hesitate to text or call if you get lost. Eastlake #3 Park and Nature Preserve is tucked away in a suburban area with the City of Thornton yet is provides an oasis for nature and a pleasant easy hike/walk around a picturesque lake. The trail is mostly gravel but easy to walk on. The park is particularly beautiful in the fall when the trees and grasses turn to yellows, oranges, and reds. Example photos will be posted soon! But click this link to see photos from Gohikecolorado.com! From the East: Traveling West on 120th, turn North onto Colorado Blvd. Turn West onto 124th then North onto Fillmore St. Park on the street in front of the tennis courts. From the West: Take 120th East to Claude Ct. Turn North onto Claude Ct. Turn East onto 124th then North onto Fillmore St. Park on the street in front of the tennis courts. I will meet you under the gazebo in front of the middle tennis court! Don't hesitate to call or text if you get lost! 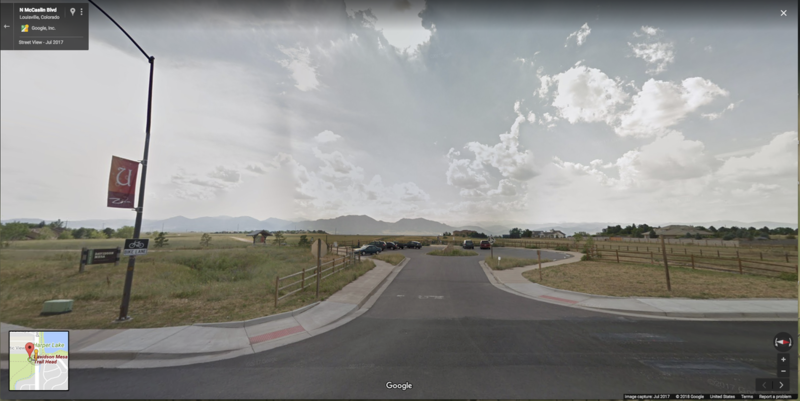 Davidson Mesa Trail is located right next to a dog park in Louisville. It offers an expansive grassy field and beautiful views of the Flatirons and mountains. As you continue down the trail there are some rocks, yucca, and trees. There is a small parking lot but if it is full you can park at Harper Lake just across McCaslin and walk through the pedestrian tunnel to the Davidson Mesa Trailhead. See Below for example photos! From Hwy 36, take the McCaslin Blvd exit and head North on McCaslin. Turn West at Washington Ave into the parking lot. If this is full, go straight across McCaslin and park at Harper lake. Then use the pedestrian tunnel to walk to the Davidson Mesa dog park. I will meet you in front of the dog park! Don't hesitate to call or text if you get lost! The perfect Urban Landscape to showcase your style for your Senior photos! The RiNo District has a beautiful mix of brick, metal, wood, and colorful graffiti that will give your Senior portfolio a diverse look. We will meet at the Denver Central Market: 2669 Larimer St, Denver, CO 80205. Graffiti in the RiNo District changes all the time, so I cannot guarantee a certain piece of artwork will still be available during your photoshoot.